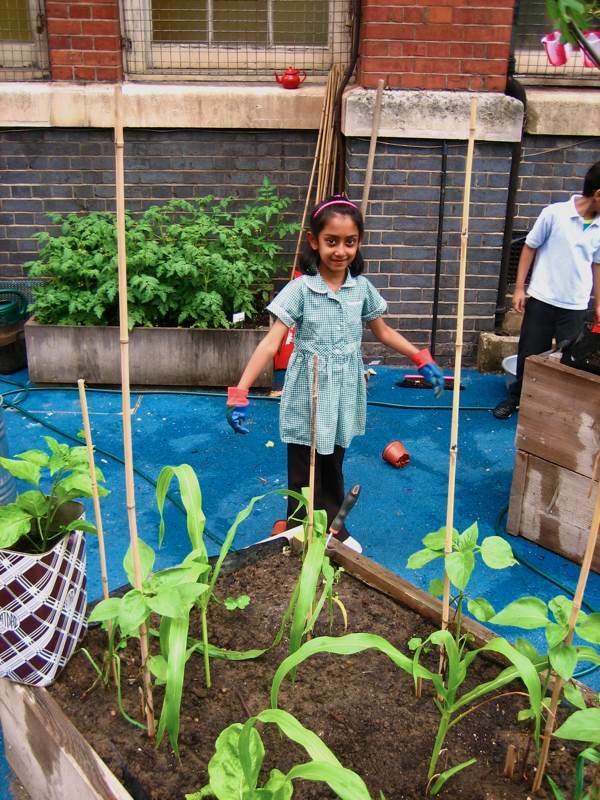 There is a tiny triangular yard at the front of Virginia Rd School next to Leila’s Cafe that has been transformed into the school vegetable patch over the last year – where, each Tuesday afternoon, Leila McAlister supervises the after-school gardening club encouraging pupils to grow their own produce. 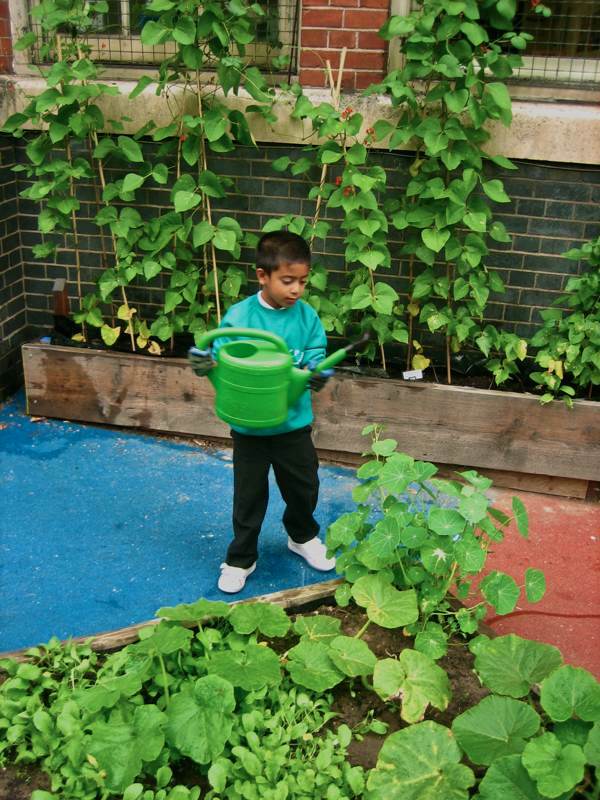 Most of the eager gardeners are residents of the Boundary Estate and do not have gardens of their own, which makes this an especially valuable experience. 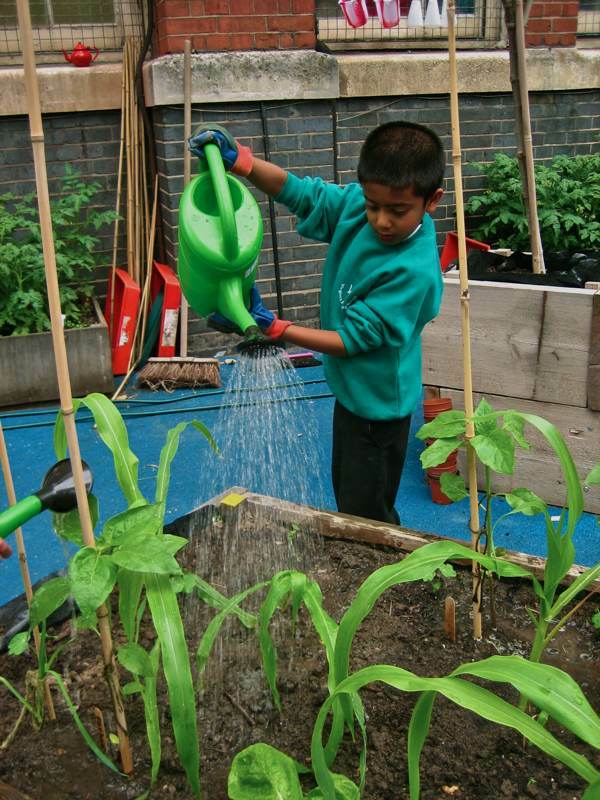 And then last year, in a surprising development, the pupils of Virginia Rd School (who have their own school council) won a grant of a thousand pounds, which they applied for themselves, from Tower Hamlets’ Healthy Lives Team, to encourage vegetable growing in the borough. “I’m a governor of the school and it came up in the meeting that they had won this grant, and so I volunteered to take it further.” Leila admitted to me in delighted amazement, as the twelve members of the gardening club – aged between six and eleven – streamed excitedly through the blue gate, eager to begin. Once everyone helped themselves to cherries from the bowl, there was a short tour of the garden to assess the progress of the vegetables since last week, weaving our way among the raised beds and the pile of car tyres filled with soil that were now sprouting luxuriant growth. The giant pumpkins and sunflowers were ahead of themselves, and the lettuces and radishes grown from seed were making a healthy showing too, but once we got down on our knees it was apparent that some thinning out was necessary – an ideal job for nimble, small fingers. 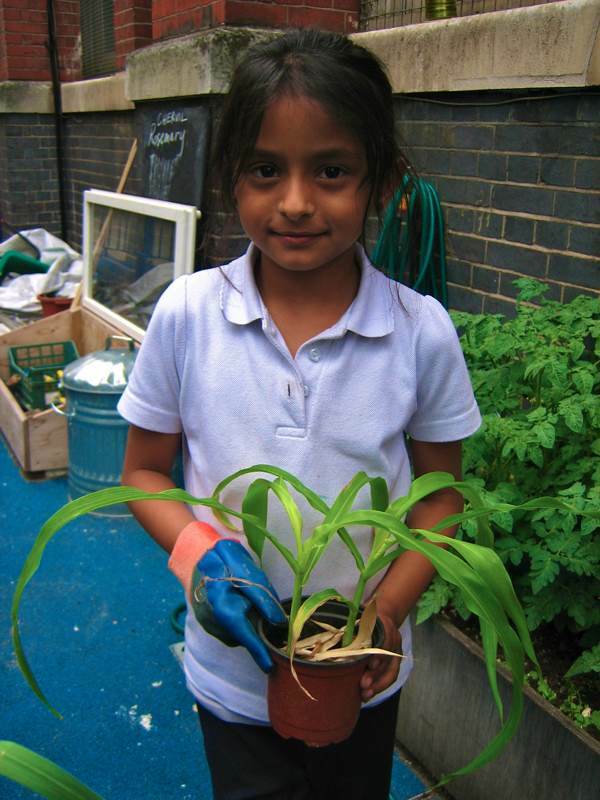 Then Leila produced a tray of corn seedlings for each of the young gardeners to take one and plant it. Gloves on and trowels at the ready, they were particular to tap the pots and tip the plants into their hands before planting, without damaging the roots. But, in their enthusiasm, some had not yet dug the hole – a situation which required the dexterous accommodation of holding a seedling in one hand whilst digging a hole with the other. You will be relieved to know that everyone achieved the desired result, planting an array of corn plants equally spaced between the line of sunflowers. 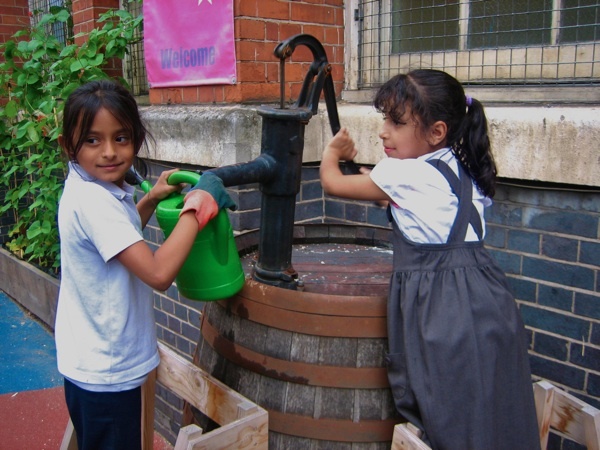 The time had arrived to bring out watering cans and fill them from the pump, always a highlight of an afternoon at the gardening club. 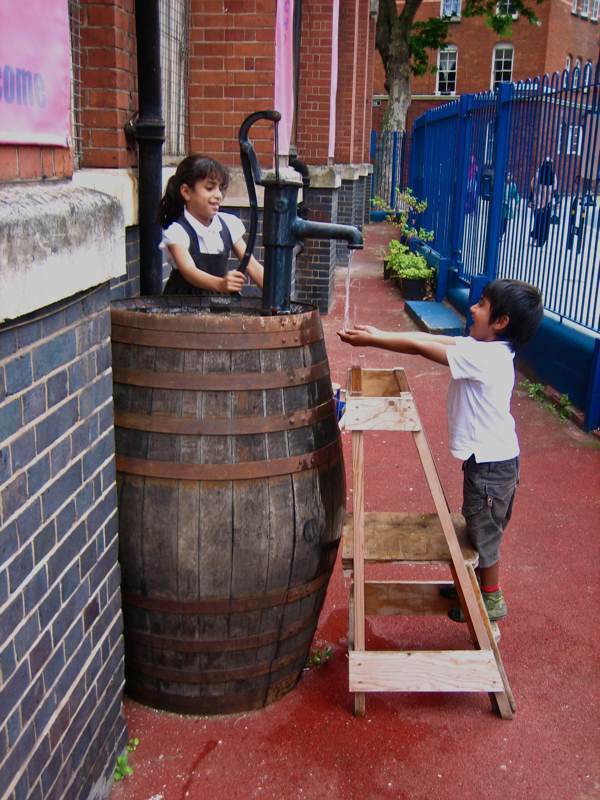 One small person climbs up a ladder to reach the handle of the pump while another small person climbs up another ladder to hold the can under the spout where the water gushes out – the possibilities for high jinks are endless and never before has the filling of a watering can become such an adventure. 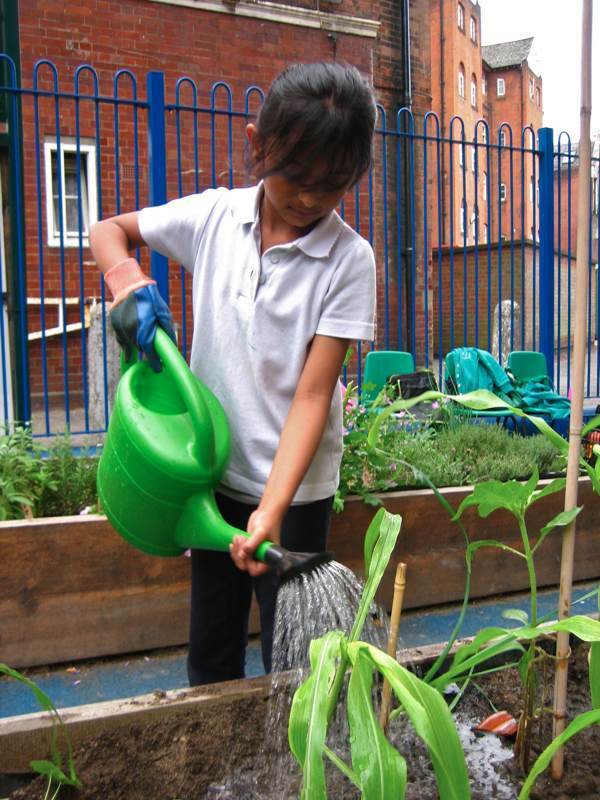 The result is that members of the gardening club are eager to fill their cans as many times as possible and give their plants a good drenching. Already, an hour had slipped away and, even as Leila produced some old olive oil tins and invited her young assistants to plant chilli pepper seedlings in them, parents were arriving and poking their heads through the railings, curious to observe the children’s horticultural achievements and smiling in approval. Then, from the lowering sky, where the clouds had been gathering upon this humid afternoon, came the first drip-drops of rain. And so, with a wave of thanks to Leila, the members of the gardening club helped themselves to the last of the cherries from the bowl and ran back to their homes scattered around Arnold Circus to shelter from the rain, leaving their newly planted vegetables to take care of themselves, in keen anticipation of new growth by next week. 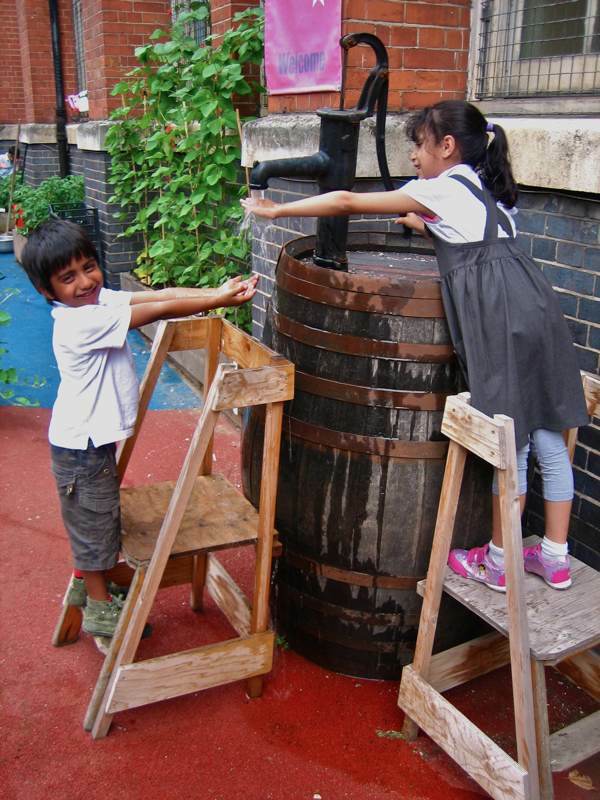 Filling the watering cans from the pump is a highlight at the gardening club. These children inspire confidence in the future – the delight they are taking in this activity, and their openness to joy and life, has made cheered me in mid-winter and very windy Melbourne. what if you followed them home and got some recipes for us? another fabulous report, thank you. 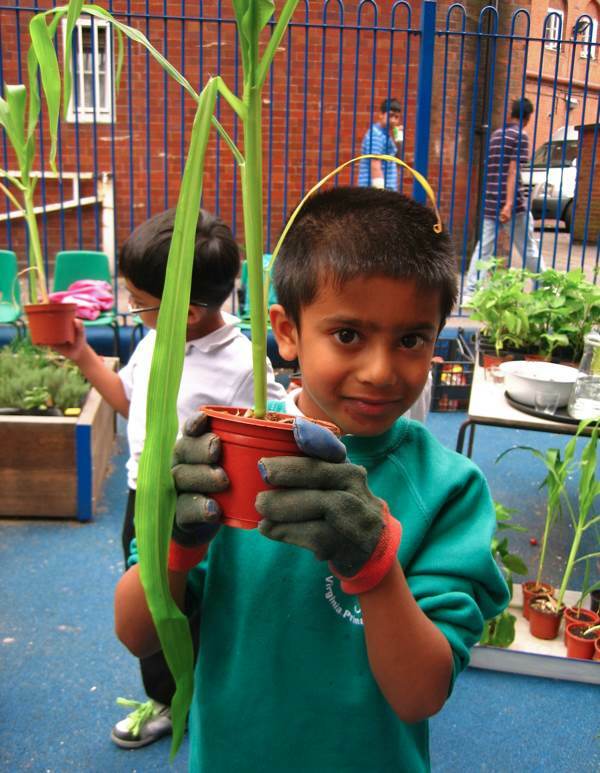 Connecting children with nature – can there be a better lesson in life? 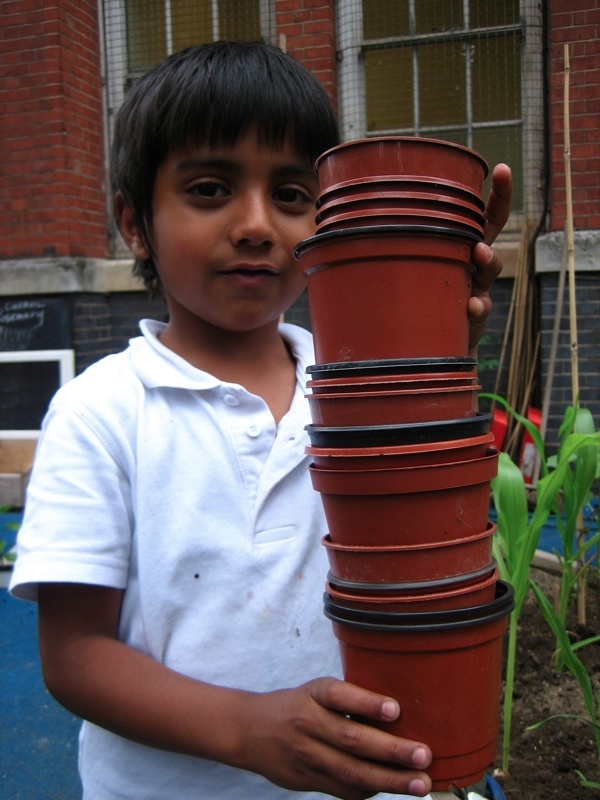 Well done Leila for helping these inner city children to see how you can grow so much in containers. 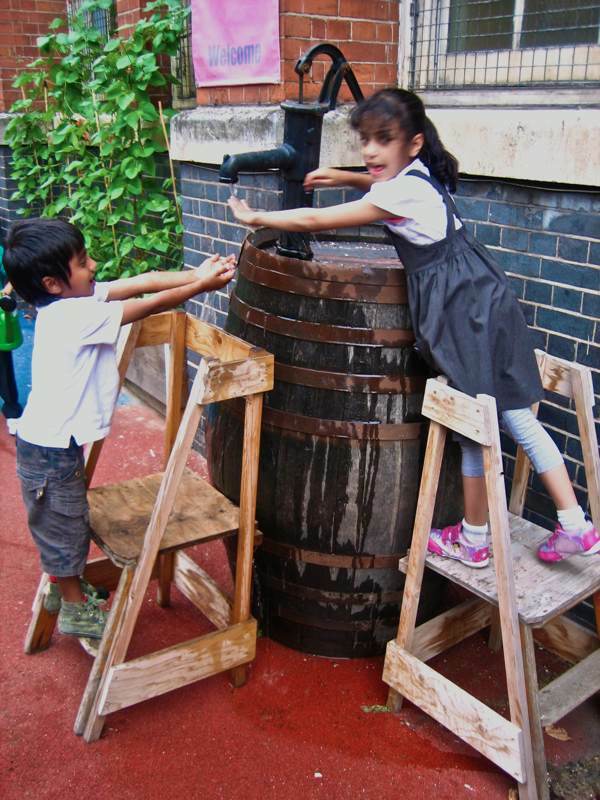 And some Bob Flowerdew-type towers made out of tyres – perfect! Another inspirational post – thank you GA. This is so great, what sweet kids and what a great scheme. People who don’t appreciate what Leila and her shop are doing for the local community need look no further. You don’t need lots of money and fancy toys to make a child happy. This project is worth so much more than that, a little haven of peace and greenery in a bit of the inner city. 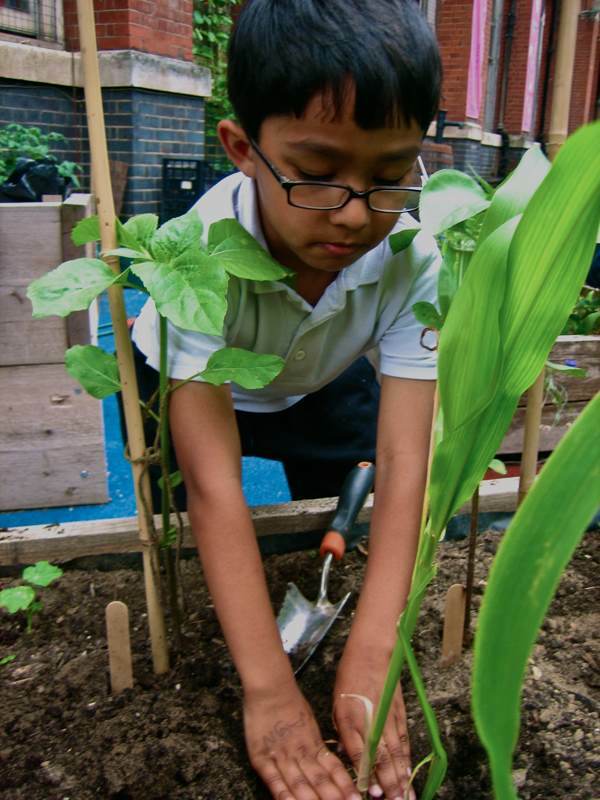 Educational too – all children should know where the food they eat comes from.